Violin Rocks! w/ Geoffrey Castle | Academic Entertainment, Inc.
Violinist Geoffrey Castle puts the violin back on center stage with virtuoso showmanship and a 21st century style. This dynamic performance will forever change students’ misconceptions of what is possible on a violin, while giving them a new perspective on the dynamic history of the ORIGINAL lead instrument. Violinist Geoffrey Castle puts the violin back on center stage with virtuoso showmanship and a 21st century style. Violin Rocks! Rockstars Do Homework! is a musical assembly that will forever change students’ misconceptions of what is possible with a violin, and within themselves, while giving them a new perspective on the dynamic history of the ORIGINAL lead instrument. Empower students to dream big and to fearlessly act upon big ideas. Geoffrey Castle uses his unique abilities and experiences to communicate to students a message of self-motivation and using education as an avenue to achieving one’s dreams. i.e. Rockstars Do Homework! Students become empowered to have big dreams and to have the courage to act upon big ideas. Experience the evolution of this classical instrument to the era of the 21st century. Though originating in Italy, there are traditions of playing the violin from all over the world. 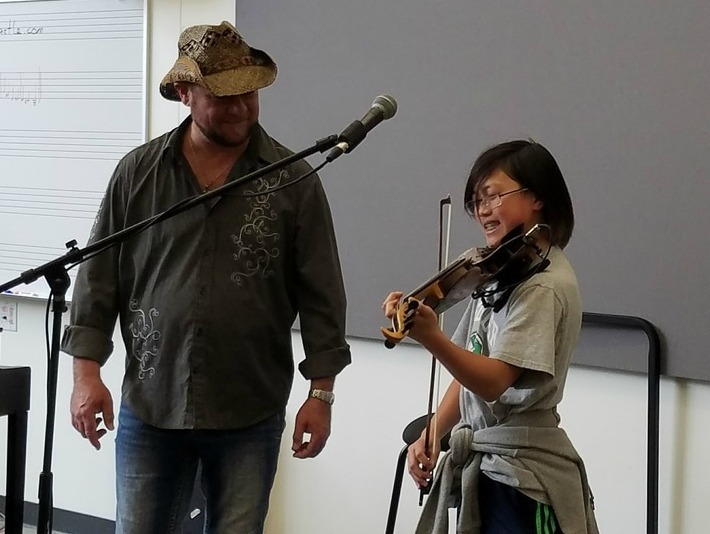 Geoffrey brings students on a journey exploring the different cultures from which various genres of music have been sourced throughout history, including Celtic, Middle-Eastern, Bluegrass, Classical, and Rock genres. The difference between an electric and an acoustic violin, and the difference between a fiddle and a violin are discussed. Suitable for all ages, and designed for maximum entertainment! This presentation combines musical performance and opportunities for student interaction and participation to engage and inspire! In addition to school assemblies, workshops and small classroom presentations are also available. All presentations emphasize self motivation and the use of school and education as a resource to achieving goals and dreams. With the school orchestra: in a one class period workshop Geoffrey walks students through the different equipment he uses to make his music. He also discusses techniques and practice strategies for students who want to move into improvised and/or electric music on string instruments. This presentation is designed to be an informal question-and-answer session, with lots of opportunities for student interaction. Through a show-and-tell and question-and-answer format, students learn what it is like to be a professional musician, and how education enables Geoffrey to be a successful musician and composer. Geoffrey also played at the Rock and Roll Hall of Fame in North Carolina with members of Tower of Power, Yes, The Hooters, Queen, and Debbie Gibson. Arrival: Geoffrey will arrive 30 minutes prior to show time to allow set up and accommodation to any last minute details. Assistance: A sound-tech to assist with PA system hook-up. Assembly Requirements: If Geoffrey is unable to bring a PA system, please have a PA system available. Geoffrey can provide a short equipment list if needed. If able, please provide a bottle of water. Change what students thought was possible on the violin and give them a new perspective! Violinist Geoffrey Castle puts the violin back on center stage with virtuoso showmanship and a 21st century style. This performance will change misconceptions about what was possible on the violin – giving students a new perspective on the dynamic history of the original lead instrument. Though originating in Italy, there are tradition of playing the violin from all over the world. 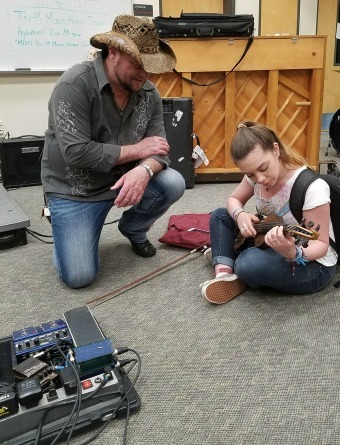 Geoffrey brings students on a journey exploring the different cultures from which various genres of music have been sourced throughout history, including Celtic, Classical, Middle-Eastern, Bluegrass and Rock. This presentation combines musical performance and opportunities for student interaction and participation to engage and inspire students. Geoffrey Castle uses his unique abilities and experiences to communicate to students a message of self-motivation and education as an avenue to achieving one’s dreams. Students become empowered to have big dreams and to have the courage to act upon big ideas. Today we had our Discovery Day that featured Geoffrey Castle with “The Violin Rocks!” His performance was incredible!!!! The students and staff could not stop raving about him! Not only is he extremely talented, but he had such a great message for our students. We will definitely keep him in mind for future assemblies!! Geoffrey Castle was amazing! We thoroughly enjoyed having him perform at Cranbury School. The students and teachers were amazed by his musical talent. His electric violin show was truly exhilarating. What a wonderful experience and we are so glad we had him as part of our enrichment program. Laura Dufort - Enrichment Coor. Geoffrey did an amazing job of making the violin accessible to our 8-12 year olds. They had a great time, and we're excited to have him back! This was an absolutely fantastic assembly! Kids and teachers are still talking about it as one of the best assemblies we've ever had at our school. Would be great to have Geoff work in our district some more. Geoffrey Castle was very appreciated today by our students at Hazelwood. He played with absolute precision. Any child who even complained a little should be chastised and put in detention. He orchestrated the entire hour with reading as the crux of the message, as requested, and went above and beyond with his amazing talent.The show was very well thought-out and beautifully executed, a work of art.We are very fortunate to have him as a local artist. Thank you for the wonderful artist via your website. Geoffrey Castle's demeanor was exceptional. He was incredibility talented and likable. Geoffrey's performance was engaging and pitch perfect! Geoffrey Castle not only put on a GREAT show for our library patrons, being the son of a librarian, he really understood our mission. He promoted reading and libraries throughout his show, inspiring our community. Our patrons were mesmerized by his talent but his warmth, enthusiasm and inspiration for young people really made the show shine! We look forward to having Geoffrey back at our library! We loved Geoffrey! I overheard someone say "He was the PERFECT cherry on the top of our last week of school” and I couldn’t have said it better. The kids loved him, the teachers loved him, we, the PTA, loved him. He was so engaging! We loved how he walked through the sea of kids playing! Geoffrey is true talent and we just loved our morning with him! Geoffrey's program was at the Redmond Library not a school. His program was for all ages and he accommodated the theme very well. His program was part of a Summer Reading Program kick off event we had at our library. Not only did he rock the 144 patrons attending the program with his violin, he also promoted summer reading as well as any library worker and he did it extemporaneously. Geoffrey is a great performer with a great program. We thank him very much.